Hamas posted words of support Sunday for British Labour Party leader Jeremy Corbyn. Corbyn has been under fire for his shows of support for Palestinian terrorist groups. 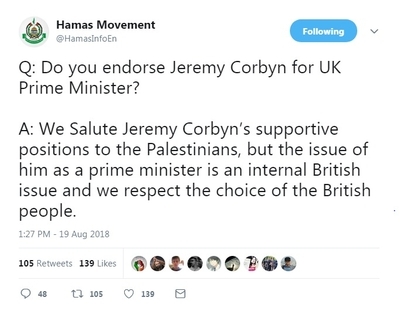 "We Salute Jeremy Corbyn's supportive positions to the Palestinians, but the issue of him as prime minister is an internal British issue and we respect the choice of the British people," Hamas said in a Twitter post. It is not surprising, given Corbyn's interactions with Palestinian terrorists over the years, many of which have been reported by British media outlets in recent weeks. For example, he attended a 2012 conference with Husam Badran, leader of Hamas' military wing in the northern West Bank who plotted numerous suicide bombings during the Second Intifada. Former Hamas Politburo chief Khaled Meshaal also attended the conference, as did Abdul Aziz Omar, who received several life sentences for his role preparing suicide vests. Omar and Badra were freed as part of a deal that led to the release of captured Israeli soldier Gilad Shalit. Corbyn praised the 2012 release of Hamas terrorists on Iranian TV. Two years earlier, he compared Israel's blockade of Gaza with the Nazi blockade of Leningrad during World War II. Corbyn also shared a stage in 2014 with Maher al-Taher, a member of the Popular Front for the Liberation of Palestine (PFLP). A month later, the PFLP murdered a British rabbi in a synagogue. He spoke at a 2002 London rally alongside PFLP leader and plane hijacking pioneer Leila Khaled. The two appeared together again in 2011 at a conference held in Lebanon organized by former Member of Parliament George Galloway, who has fundraised for Hamas. He attended a wreath-laying ceremony in Tunisia at the graves of the terrorists responsible for the 1972 Munich massacre of Israeli athletes. Back in 2016, Corbyn had to apologize for having referred to Hamas and Hizballah as "friends." Corbyn's links with Palestinian terrorists could dampen his dreams of succeeding Prime Minister Theresa May, British terrorism researcher Kyle Orton, formerly with the London-based Henry Jackson Society, told the Investigative Project on Terrorism (IPT). "In political terms, these revelations have had the effect of rallying his core support around him and, paradoxically, the sheer number of horrific facts coming to light has shielded Corbyn by inducing fatigue. It is quite likely some damage has been done to Corbyn, perhaps enough to prevent him winning the next election, but he will make it to the next election as Labour leader," Orton said.